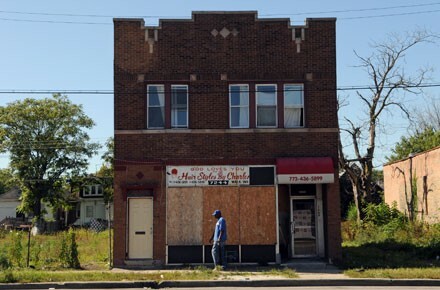 A pedestrian walks past a boarded-up hair salon on the 7200 block of South Ashland in Englewood last September. Chicago's homicide rate has drawn headlines this year, locally and nationally, and not without reason. Through July, 308 people had been slain here, 27 percent more than in the first seven months of 2011. Every life lost to homicide is a tragedy, of course—and a sense that the life was unfairly taken often heightens the pain. Compounding the unfairness, residents of certain neighborhoods are far more likely to suffer that fate. We illustrated this last month by comparing homicide rates in two sets of Chicago communities—the five poorest and the five least poor. The homicide rate in the poorest neighborhoods was 11 times the rate in the least-poor neighborhoods. And if that isn't unfair enough, poverty—and especially the concentration of poverty that segregation causes—kills disproportionately in nonviolent ways as well. Using the same two sets of communities, we extended our analysis beyond homicide—the eighth-leading cause of death in Chicago—to other, more common causes of death. Our comparison shows that poor African-American neighborhoods should come with a surgeon general's warning. When it comes to the leading causes of death in Chicago (cancer, heart disease, diabetes-related illnesses, stroke, and unintentional injury), the mortality rate in the five poorest neighborhoods—Riverdale, Fuller Park, Englewood, West Garfield Park, and East Garfield Park—was far higher than in the five least-poor neighborhoods— Mount Greenwood, Edison Park, Norwood Park, Beverly, and Clearing. For diabetes-related deaths, it was almost double; for unintentional injury, it was more than double. The infant mortality rate—the rate of death in the first year of life—was two and a half times as high. And the death rate from all causes was 60 percent higher than in the wealthier counterparts, and 43 percent higher than the citywide rate. We drew the figures from a data set published in July by the Chicago Department of Public Health, based on deaths from 2004 through 2008. In the five poorest neighborhoods, between 40 and 61 percent of the households were in poverty, according to Census Bureau estimates for 2006-2010. These communities are 93 to 98 percent African-American. The least-poor neighborhoods had poverty rates of 3 to 6 percent. All of these are majority white, and only Beverly has a sizeable proportion of African-Americans (35 percent). While the disparity in homicide rates among the wealthy and poor is indeed remarkable, homicide claims relatively few lives. From 2004 through 2008, just over 4 percent of deaths in the five poorest neighborhoods were due to homicide. That's a much higher proportion than in the five least-poor neighborhoods, where about one-third of 1 percent of deaths were due to homicide. In the poorest neighborhoods, many more deaths were due to cancer (22 percent) and heart disease (15 percent) than to homicide. So the economic and racial disparities in nonviolent causes of death, especially cancer and heart disease, merit close attention—more attention than they've been receiving. But there's another way to look at the toll of a high homicide rate on a community. The vast majority of homicide victims are ages 15 to 34, while heart disease and stroke fatalities tend to be much older. Homicide, in other words, robs more years of life than the standard mortality rates indicate. The Metropolitan Planning Council tries to stir policy makers into targeting segregation by showing how white people suffer from it too. A report by the mayor’s public health department offers 200 “actionable strategies” to diminish health inequities. Reducing segregation isn’t one of them.